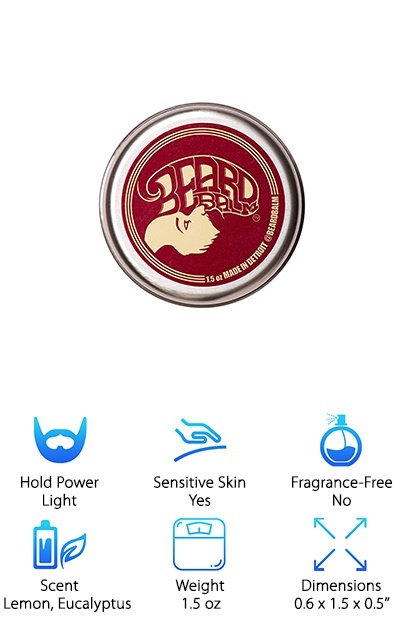 What does beard balm do? It acts as a conditioner and shaping agent that works well for beards of all lengths. Say good-bye to flyaways, flakes, and itching! We’ve reviewed some of the best-selling beard balms to help you choose the perfect option for your beard and skin type. If you’re new to the world of beard grooming, take a look at these specs to consider when picking out a beard balm. Hold Power Different balms have Light, Medium, or Strong holding power. Wild beard? Look for a stronger hold. Sensitive Skin A balm formulated for sensitive skin should have limited, “bland” ingredients and little to no fragrance. Fragrance-Free If fragrances can be too overwhelming for you, try out a fragrance-free balm. These are also more skin-friendly. Scent Some beard balms come in a variety of scent options, so we make sure to keep track of them for you. Weight How much product are you getting? This can range from .5 to 4 ounces, and a little goes a long way! Dimensions Want a tin that fits easily in your pants pocket? A narrow tin around two ounces or less should do the trick. Now that you’re truly prepared for your beard balm buying experience, our reviews are waiting for you! The top pick and budget pick are our overall favorites, but you can explore a variety of other options if you keep reading. Your beard’s been missing out on proper care and attention for so long… it’s time to change that around! What is beard balm for, if not making you feel like a true gentleman? The Gentleman’s Premium Balm is a glorious choice for bringing out the best in your beard. This chemical-free, natural formula is handmade in the USA with conditioning and softening ingredients. It has a medium hold power for gentle shaping and smoothing of your beard. The ingredients feature beeswax, shea butter, coconut oil, sunflower seed oil, argan oil, and more. There are no irritating essential oils, extracts, or fragrances, so it should work well for sensitive skin types. Evening primrose oil and chamomile flower extract help to soothe your skin and prevent inflammation. This balm has a good amount of holding power for keeping your beard under control and looking awesome! It made it as our overall top pick because it should work for a range of skin types and beard types. Plus, the tin fits easily in your pocket! 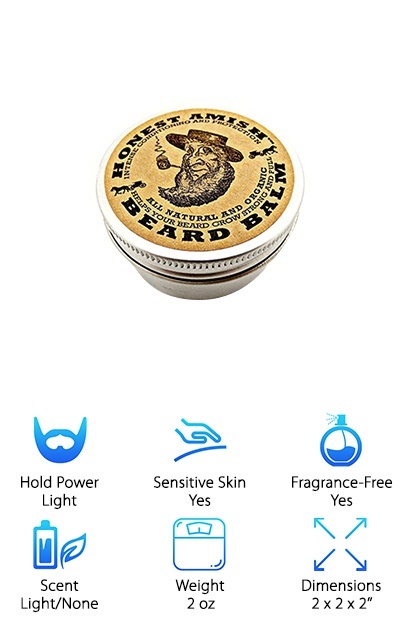 For a beard balm with a heavy focus on conditioning, look no further than our budget pick beard balm review: Honest Amish Beard Balm. This beard balm melts easily in your hands to smooth and moisturize your beard. The organic, all-natural ingredients result in a fragrance-free balm with a light beeswax scent. The botanical ingredients include fruit and nut butters as well as oils. Butters include shea, cocoa, and kokum, while your beard will also be pampered by avocado, argan, pumpkin seed, and apricot oils. Plus, this balm is handmade in the USA and comes in a recyclable two-ounce tin. Four-ounce tins are also available if you want to fully commit to the Honest Amish way of life! All of the Honest Amish beard balms are fragrance-free and avoid irritating ingredients, so they’re recommended for sensitive skin. These have light holding power so they work well for shorter beards or relatively tame ones. 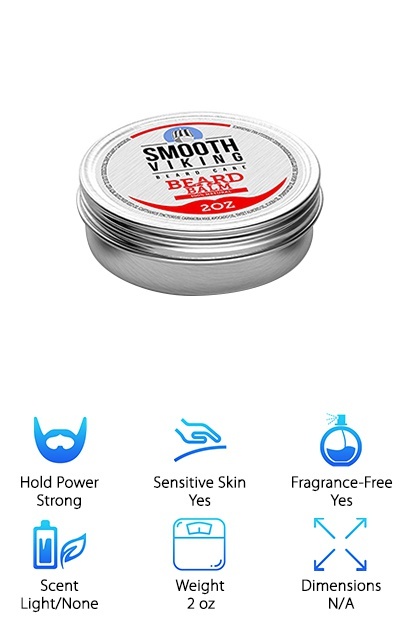 The Smooth Viking Beard Balm is an all-natural beard balm made in the USA with a variety of ingredients to provide strong shaping as well as conditioning your beard. Beeswax, shea butter, and mango butter provide thickness as well as conditioning, while moisturizing oils and essential oils provide moisture and sheen. With no drying alcohols or artificial ingredients, this beard balm is a safe bet for sensitive skin. The light scent disperses quickly, so it’s a great option for men who don’t want a heavily scented or waxy-smelling beard balm. 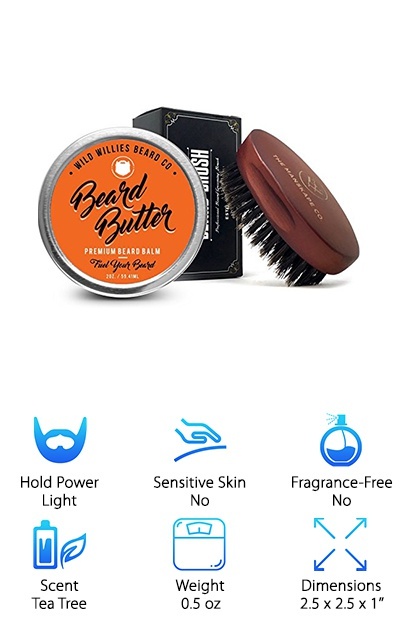 If you need to tame your beard while also softening it and keeping away beard dandruff (or “beardruff”), this beard balm is one of the thicker, stronger options available. It’s ideal for longer beards and helps calm and moisturize your skin on top of that! The small, slim tin size fits easily in a back pocket or in a bag or coat pocket. 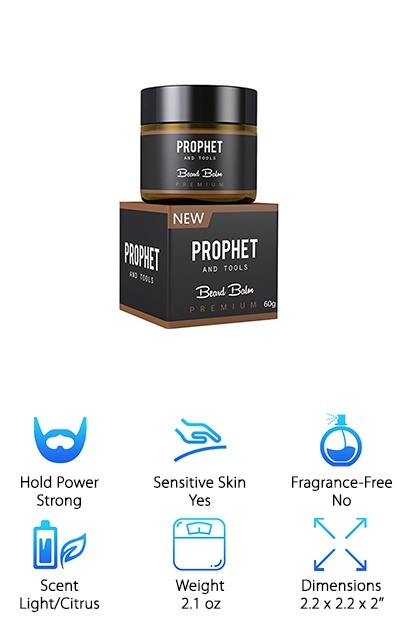 If you’re looking for a beard balm with a stronger hold combined with conditioning power, the Prophet and Tools 2-in-1 Balm might be for you! If you know how to apply beard balm and what it’s for, you’ll know that a wax is what you use for greater styling power. This beard balm offers a combination of styling hold and conditioning that’s ideal for wilder beards. Plus, this balm is made to be a clear, crystalline white that won’t stain lighter-colored or white beard hairs. It has a light, peachy scent that doesn’t stick around long, so it’s a good option for men who don’t want a heavily scented beard balm. For this reason, we’d call it a safe bet for sensitive skin, since it has a short ingredients list and no added fragrances or essential oils. The organic, all-natural ingredients include shea butter and beeswax, plus a few different oils! 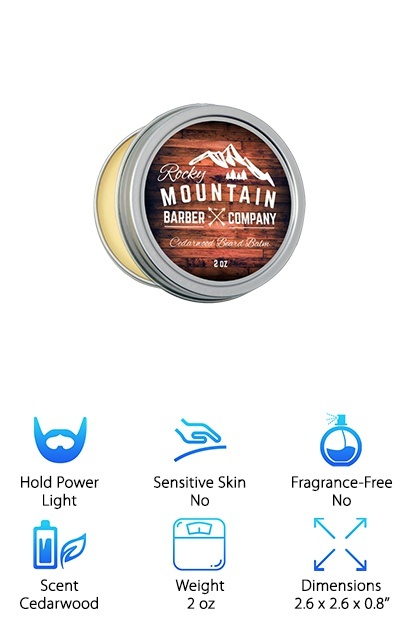 The Rocky Mountain Natural Balm comes in a slim two-ounce tin that you can easily tuck into your pocket to carry with you wherever you go. The cedarwood scent is outdoorsy and, of course, super-manly, and the all-natural ingredients are all Canada-sourced. The balm uses ingredients like jojoba oil, beeswax, coconut oil, grapeseed oil, shea butter, and tea tree oil to condition your beard and keep itchy, flaky skin at bay. There are eight essential oils in the balm to give your beard shine and softness, but that variety of essential oils may not play nicely with sensitive skin. If you want all-natural ingredients in your beard balm, you’ll appreciate the use of oils and natural extracts! This balm is very “melty,” so it has a light hold power that works well for relatively tame or short beards. For greater shaping power, you may prefer a wax or a heavier balm. The Wild Willies Beard Co. helps you maintain and condition your beard with the Manskape Beard Butter, available in .5 oz or 2 oz tins. Choose from the Original tea tree scent or the Cool Mint scent for a refreshing addition to your beard care routine. If you’re an environmentally conscious beard grower, you’ll love the organic ingredients, all blended together in Georgia, USA. It’s easy to learn how to use beard balm with the smooth, soft formula of this light-hold “buttery” balm formula. Argan oil, sweet almond oil, shea butter, and ten other ingredients combine to soften and condition your beard. If you have sensitive skin, you may find that the Cool Mint fragrance irritates your skin, even if it produces a cooling sensation at first. But if you’re looking for a beard balm available in fresh, head-clearing scents, you’ll like the effect of this beard balm. 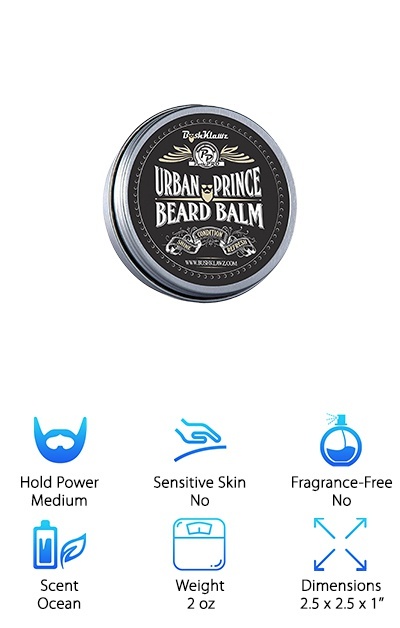 This beard balm from BushKlawz comes in an Urban Prince scent that’s fresh and ultra-manly. The base of this buttery beard balm features a variety of oils like jojoba, argan, sweet almond, emu, and tamanu to tackle every angle of your beard and skin moisture needs! The balm gets its thick texture and hold power from shea butter, castor oil, and yellow beeswax. The refreshing masculine scent can substitute for cologne or aftershave if you like, and the two-ounce tin will last you a surprisingly long time. BushKlawz is also known for their combs and beard oils, which are a great choice for men with longer beards that require consistent grooming and attention. We wouldn’t recommend this balm to men with sensitive skin since it has such a wide variety of oils, but you may like to try it out anyway just because it has so many conditioning ingredients for your beard. 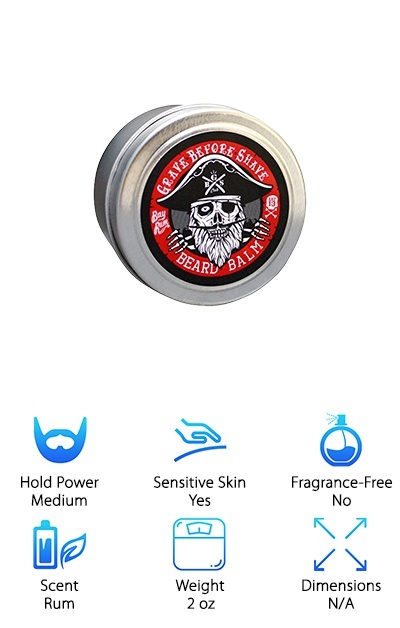 The Grave Before Shave beard balms are available in a variety of scents, but we’re going to focus on the one that makes you smell like a pirate: the Bay Rum Balm! 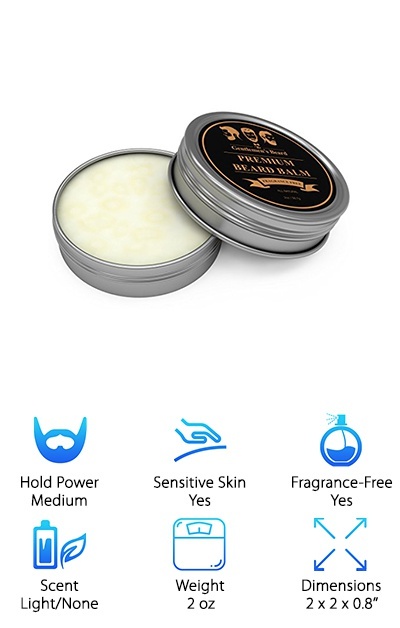 This beard balm features a medium hold--not quite a wax, but definitely not an oil. It features a mix of oils that are good for your skin and beard, including coconut, jojoba, sweet almond, and pure apricot. Shea butter and beeswax provide the thick balm consistency, while tea tree oil and aloe vera help soothe your skin and prevent flakes and itchiness. The mild scent is a great choice if you don’t want to “fill up a room” with your beard. There are nine other Grave Before Shave scents available, including Gentleman’s Blend, Outdoorsman Blend, Caramel Mocha, Head Hunter, and more! You can also find these beard balms in XL four-ounce tins if you fall in love with one! This top beard balm and conditioner comes straight from a small shop in Detroit. Their original balm features a fresh scent by combining lemon peel, eucalyptus, and geranium. The balm base is made with organic, fair-trade grapeseed and coconut oils topped with lanolin and beeswax. Their sustainable and fair-trade ingredient sourcing is a great choice for environmentally-conscious beard growers looking for softer whiskers and dry skin relief. Even the cans your balm arrives in are awesome: union-made in America from American steel! The beeswax provides a light hold, while the lanolin and oils moisturize your beard and skin, softening the hair and preventing flakes and itchiness. Whether you have a long, flowing beard or prefer a well-tended scruff, this beard balm can improve your look! This 1.5-ounce can is long-lasting, and you can also find this balm in a “Naked” formulation that is fragrance-free. The Badass Beard Balms are available in one-ounce and two-ounce sizes and twelve different scent styles. Need something fragrance-free? Secret Agent has no added fragrances! These balms feature medium/light holding power and help tame your beard as well as moisturizing and smoothing the skin underneath. The Mountain Man scent we ended up selecting features pine and cedarwood, The Biker scent is earthy with a hint of fresh peppermint, The Bushwacker focuses on fresh herbs like Eucalyptus, and that’s just a few of your options! It’s easy to find your perfect best smelling beard balm with all of these options. 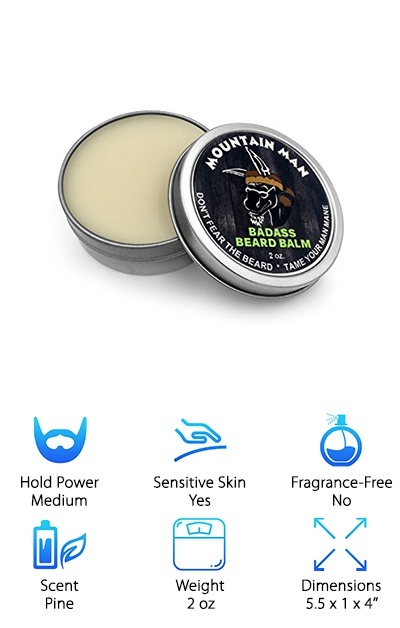 If you want a beard balm that targets your beard and skin that you can customize to your favorite scent profile, the Badass Beard Balm variety is a great choice. Match one of their scents to your cologne, deodorant, or aftershave preferences for total toiletry harmony! These balms use 100% organic, food-grade ingredients for an all-natural product that’s good to your body and your beard.